Last year, the kidlit world was taken by storm with two AMAZING verse novels. First there was BROWN GIRL DREAMING by Jacqueline Woodson, which won all kinds of awards. Then there was THE CROSSOVER by Kwame Alexander, winner of the Newbery medal. I checked both of these out from the library before they won the awards and got insanely popular, and for Christmas I'm asking for my own copies because I want to read them again and again. Maybe I can soak up a little bit of their brilliance, you know? I was thrilled to see verse novels get some time in the sun, so to speak. In the past, verse novels have gotten a bad rap from the community from time to time. "Verse is just a gimmick," some say. "It's such a waste, breaking up sentences with crazy line spaces and creating all that white space," others complain. Of course, these are mostly adults with their harsh opinions. Ask kids who've enjoyed THE CROSSOVER, or LOVE THAT DOG by Sharon Creech, or MAY B. by Caroline Starr Rose, or WHAT MY MOTHER DOESN'T KNOW by Sonya Sones and they will tell you how much they love these books and that the verse doesn't take anything away, and in fact, actually adds something wonderful. Since I've written a number of verse novels, I know that writing novels in verse isn't easy. It's a bit like walking on a tightrope, trying to balance the story and the poetry to create something that is accessible while also poetic, to write a story with a good plot and interesting characters while not using a ton of words. It's tough! But when it's done well, it can be a pretty magical reading experience. And I'm so glad there have been books lately that prove to the world there is nothing wrong with writing this way. So what if they're different? I mean really, so what? If people don't like them, they don't have to read them. But to out and out say awful things in generalities is just not very useful, and in fact can be hurtful to the authors who enjoy writing this way. Trust me, I know this too well. Anyway, last week, I finished a verse novel I want to recommend to all of my readers (12 and up) who love verse novels. 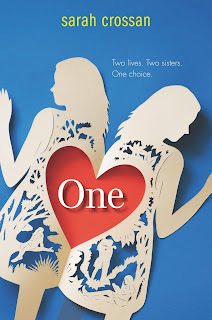 It's called ONE by Sarah Crossan. It's about a set of conjoined twins, Tippi and Grace, who you will fall in love with. This book made me laugh and made me cry - my favorite kind of book! Not only is this book a really, really good read, it also made me long to write an entire novel in verse again. It actually made me excited at the thought. Because of the criticism they were getting a few years back, I went through a bit of a crisis with my writing. I didn't want to write entire books in verse anymore. I didn't want to be put under a microscope for someone to declare whether it was just a "gimmick" or not. Besides, I told myself, if I write in mostly prose, maybe I'll be more popular. Ha. Hahahaha. I will never be one of the "popular" YA authors. So really, I need to do what I do best and not worry about anything else. And when it comes to YA, I think that's writing in verse. I'm fifty pages in on a new project and having so much fun. So thank you Sarah Crossan, not only for writing this amazing book, but also for putting me back on the path I veered away from for a while. I don't know what awaits me up ahead, but I'm enjoying the journey and for me, that's the most important thing when it comes to writing.